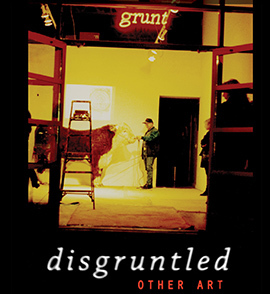 Your support and involvement is important to the continued vitality of grunt gallery. Founded in 1984, grunt gallery is an artist-run centre that supports projects of diverse content and execution. Our activities include exhibitions, performances, media presentations, publications, websites, archival research and production, publicly sited projects, socially- and community-engaged practice, and a rich variety of discursive programs. Our mandate is to inspire public dialogue by creating an environment conducive to the emergence of innovative, collaborative, and provocative Canadian and international contemporary art. Join us! There are so many ways to be involved: become a member, volunteer, monthly donor, or simply donate. We are better with you by our side. #116 – 350 E 2nd Ave.
By giving monthly, you invest what makes sense for you and make an incredible impact over the course of your involvement. Becoming a monthly donor allows you to join a dedicated group of supporters who understand the importance of making a sustaining commitment to fostering innovative, collaborative, and provocative contemporary art. Monthly gifts enable us to maintain and expand our programs because we know we have the ongoing support of the community. Sign up to become a monthly donor here. The grunt gallery Legacy Fund is a permanent endowment managed by the Vancouver Foundation with the purpose of providing a strong and stable base of funds that financially support grunt and the artists (and community) we serve. Our endowment was opened with $150,000 in 2006, and has grown to $624,246 today, generating an annual income from the endowment’s interest of approximately $22,000. This is a significant and reliable source of income that will provide economic stability for years to come and ensure grunt’s sustainable presence in the community. Once an endowment is established, it keeps on giving forever. As a donor to grunt gallery’s Legacy Fund, you are not just supporting one artist or one exhibition; you are investing in the future of an organization that can continue to cultivate and support multigenerational artists and curators making diverse work at the forefront of contemporary art in Canada and beyond. Donate to the grunt gallery Legacy Fund here. A legacy gift is a gift for the future. Planning to leave a Legacy Gift in your Will is one of the most thoughtful ways to help others and leave a lasting impact on your community. You can even make your estate gift “in honour of” or “in memory of” a special person. I hereby leave (the residue, or $______ or ______%) of my Estate to the grunt gallery Legacy Fund (charitable registration #BN 119278794RR0001), which is managed by the Vancouver Foundation. There are many kinds of Legacy Gifts such as simple bequests in a will or estate plan, a gift of life insurance, annuities, charitable trusts, endowments and gifts of property. These deferred gifts are most often arranged when you are preparing your will or updating financial plans. There are many options when it comes to Legacy Giving, making it possible for anyone to leave a legacy of care. We are often looking for enthusiastic folks to help us out with our archives, events, and other programming. Volunteers have the opportunity to explore thirty plus years of grunt’s archive, practice technical skills, network, and learn all about how an artist run-centre operates first hand. grunt extends its deep thanks to all of our past and continuing volunteers. Without your generosity many of our projects and events would not have been possible, and your contributions to the development of our archive cannot be understated. We wish everyone the best and we hope all of our volunteers and friends stop by grunt to say hello the next time they are in the neighbourhood! Membership is free! When you sign up for our newsletter, you get a free grunt gallery membership. We strive to make ourselves accessible to all those who wish to participate, which is why we have developed a free membership. A lively and active membership demonstrates grunt’s vitality as an artist-run centre to our funders. grunt gallery is generously supported by the Canada Council for the Arts, the British Columbia Arts Council, the City of Vancouver, the Province of British Columbia, and the Audain Foundation for the Visual Arts. We are also grateful for the support of our donors, members and volunteers.